These gorgeous butterflies are a joy to colour so many possibilities, I chose to colour with Spectrum Noir and added glitter to them which does show up on a close up just really hard to get the camera to show it up well, the sentiments were cut with spellbinders dies and I inked through the dies with distress ink, mowed lawn and picked raspberry. 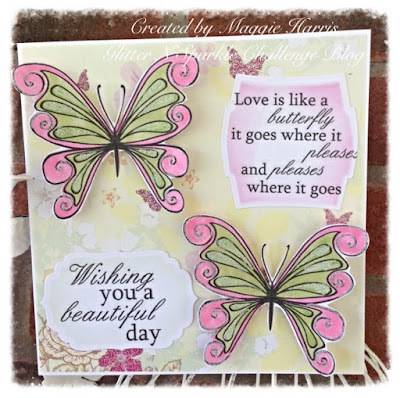 The designer paper was added to the card blank before adding the sentiments, the butterflies I mounted on foam pads. Gorgeous butterflies and pretty colours . Not seen these before so must investigate further. Hugs Mrs A.